The requirement to smile continues to pervade our everyday lives, but at what cost? Oh the irony of it all. One year I am amidst a PhD thesis critiquing the modern imperative to be happy. The next year I am employed in an environment that not only demands smiley happiness at all times but actively narrows the acceptable range of human emotions, labelling anything other than hyperactive verging on psychotic smiley-ness as ‘negative’. God knows how I got myself into this one. I have personally been told on several occasions to maintain the performance; to play the game. What I am being trained to do is actively participate in this smiley unreal world. Consequently, my inability to perform this smiley happiness at all times is considered a display of ‘negative’ emotion that is destroying the bubble of happy-happy-smileyness. The obligation to smile is predicated on the sharing of smiles. Each member must smile equally else the fragile delusion will falter. Just as the hug created an inward-looking society so too smileyness rather than an outward expression of felt emotion, is used as a barrier against acknowledging the realities of the world around us – that is to say, how things don’t always go smoothly, the complexities of human emotions and behaviours, the messiness of human relationships. Barbara Ehrenreich brillantly analysed the positive thinking imperative in her book Smile or Die, a book that was intiated following her experience dealing with breast cancer where she found herself told her recovery was dependent on her thinking positively. Her realist stance was interpreted as negativity, a stance that did not find a welcome place in the cancer survivor community. What Ehrenreich articulates so well is how positive thinking – this mandatory optimism – becomes a form of social control. We are encouraged not to complain – even in these double-dip recession times – but to remain optimistic as if the power of positive thinking is sufficient to bring about real changes in our lives. Not to mention this perpetuates the dangerous idea that the problems we sense are only in our heads and thus can be solved through reprogramming our minds. This is a useful tactic for businesses as its benefits are two-fold: it generates a subservient and passive workforce, and secondly the workforce members become so well-trained they accept the requirement to sell ones smiles – even if they remain aware of ‘playing the game’. For it easy to say it is a merely brainwashing – though it is – but most people I would suggest are aware of the game they are playing, they just accept it and decide to play it well. Through participating in this game however, you not only suffer from face-ache at the end of each day but a reshaping of how you interpret your own emotions. Happiness and unhappiness are given clear definers: happiness is always positive and unhappiness is always negative. Positive emotion is that which is outgoing; passionate to the point of obsessive. Negative emotion is voicing an opinions against the norm, failing in the required objectives and norms of behaviour. Yet if we strip down positivity to its basic definition it is essentially the possession of characteristics and negativity the absence of them. A calm demeanour for example is considered a ‘negative’ personality in the positive thinking culture. The lack of smileyness is automatically deemed as an absence rather than a presence of calmness. Smileyness is positive as it is considered to be a forward moving emotion, in other words smileyness does things – it creates sales. Calmness is not a productive characteristic to possess in this environment – it is not linear but still, non-moving; it encompasses the present without going forward. But of course calmness does things too. It is just that these things are not valued in the sales-driven corporate world. And what about unhappiness? 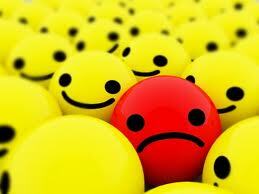 While we are so busy being smiley where does all our unhappiness go? As the spectrum of acceptable emotions gets restricted to the smiley face we not only sell our smiles but we are selling our unhappiness too. Our frustrations, disagreements, opinions, are all exchanged for increased sales and higher bonuses. But unhappiness is a useful emotion for several reasons. One, the presence of unhappiness shapes the nature of happiness – happiness makes no sense without unhappiness. Smiley faces without un-smiley faces are non-signifiers – what they have come to represent has been detached from any real sense of happiness and how smiles naturally occur. Further unhappiness is not the dark side of happiness that should simply be abolished, unhappiness has a purpose just as happiness does. Its nature is haphazard, similarly to happiness – the idea that happiness is forward moving is a myth. Emotions are often without end points or rationality, but this is lost in a corporate agenda where everything from sales targets to human behaviour must have a consistent level of performance. Unhappiness is problematic as it can allow things to occur that are out of the norm – beyond the acceptable bounds of thinking. This is why unhappiness is so dangerous but subsequently why it is so vital to our well-being and existence as feeling, sentient beings. And lastly it is important to remember unhappiness and smiles are not mutually exclusive entities. Lets get back to acknowledging the fascinating complexities of human emotions before smiley culture makes robots of all of us.